Wherever there is a deal, there is a need for an agreement form. 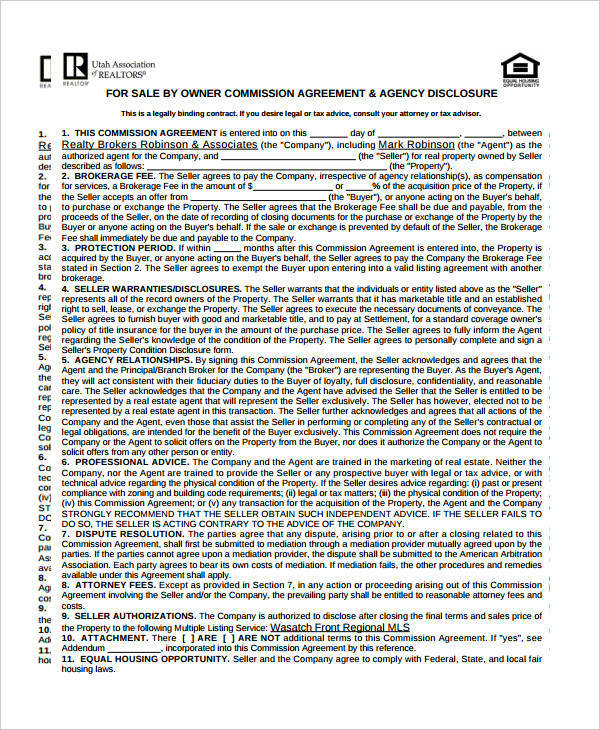 An agreement form deals with the terms and conditions of the deal that both the buyer and the seller have to agree to for the deal to go through. 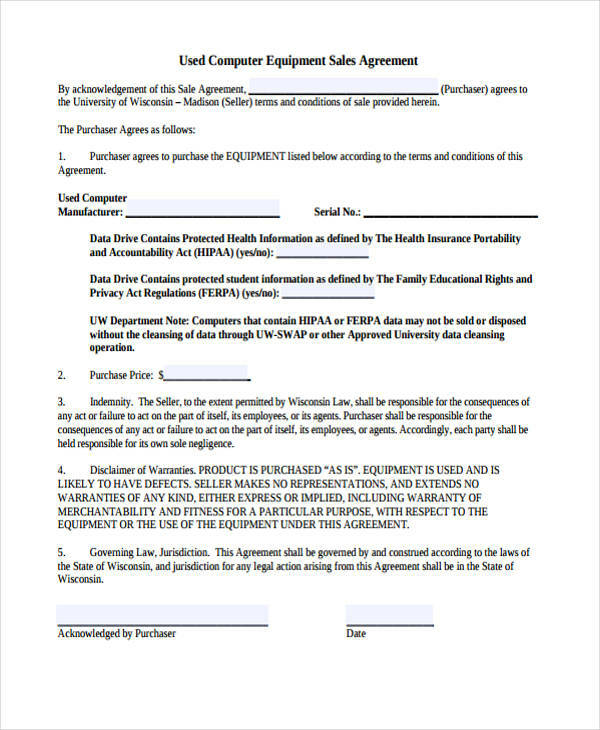 Most sales agreement forms are done to ensure that all the parties are aware of their responsibilities with each other which will then allow misunderstandings to lessen , or to not occur at all. 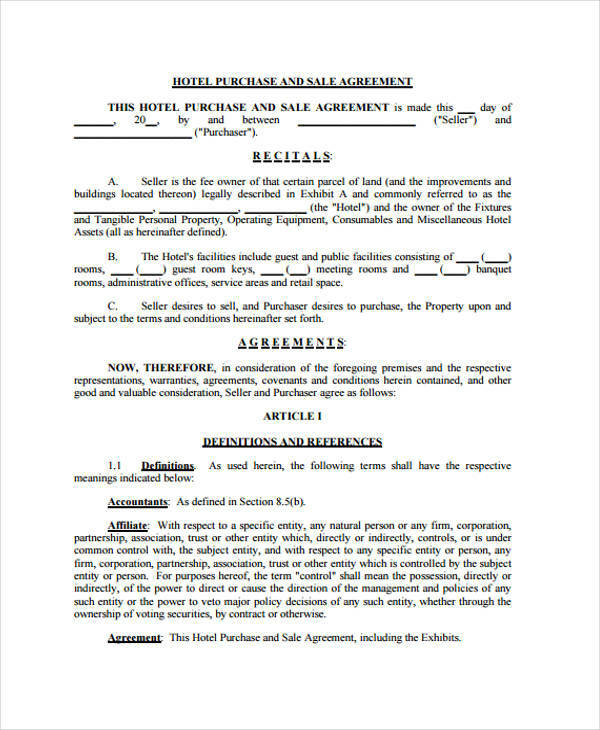 Agreement Forms are legal documents that can be used in the future for legal cases, and they are generally signed in front of a notary officer when the deal is big enough, as in the case of real estate. 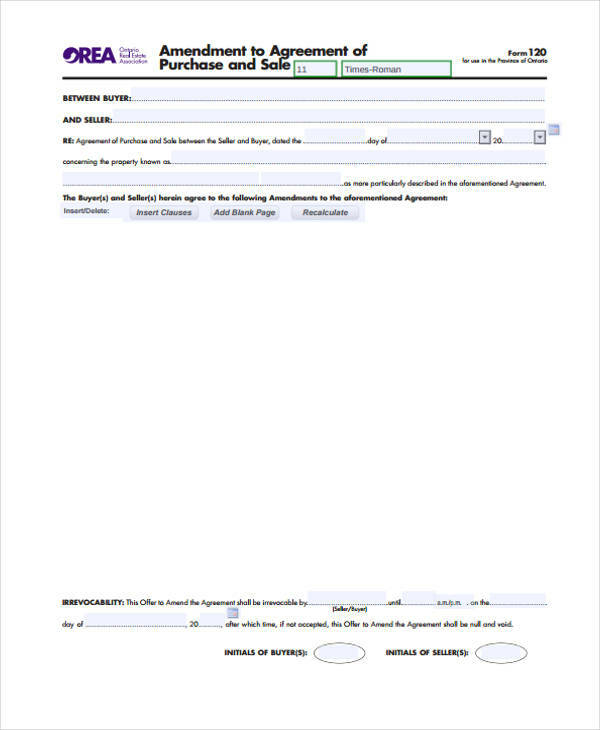 You can choose from our wide array of Sales Agreement Forms and Generic Agreement Forms to help you cut costs and save on time. 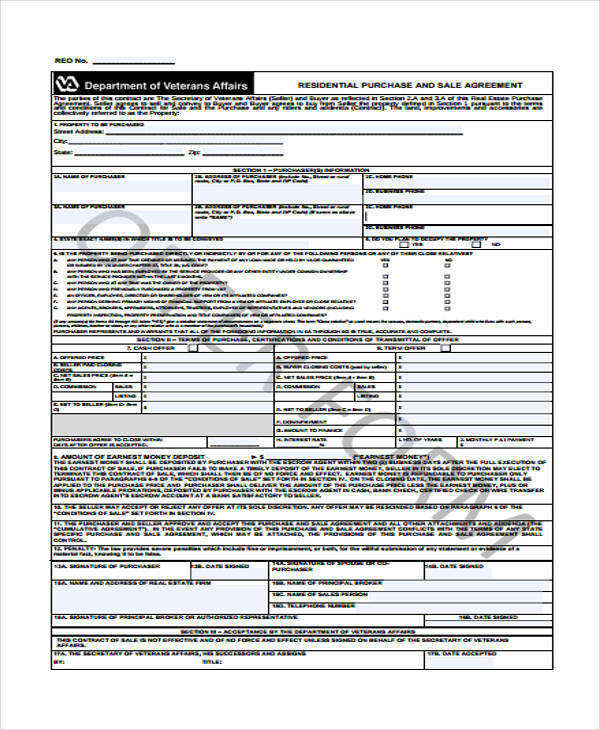 A purchase sale agreement form defines all the obligations of both the buyer and the seller. 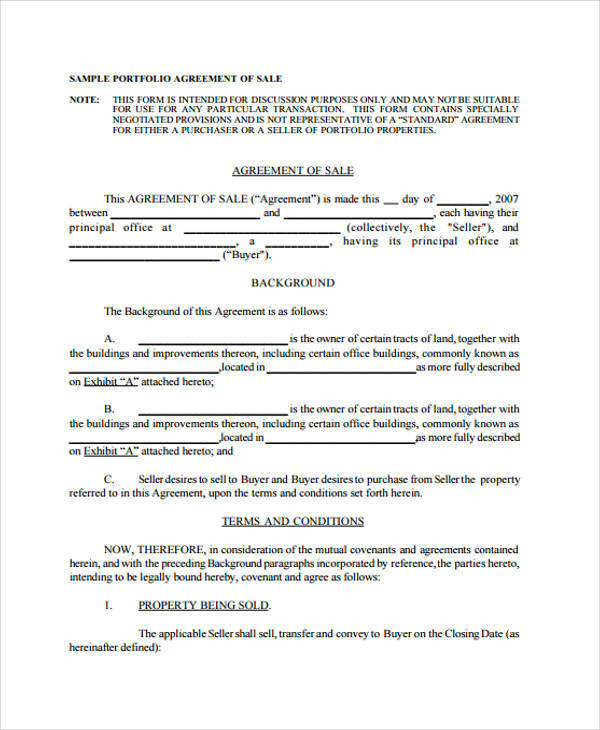 All the parties involved in a real estate property purchase transaction should be knowledgeable of the content of the purchase sale agreement form so they can see a comprehensive list of the clauses that they should be aware of. 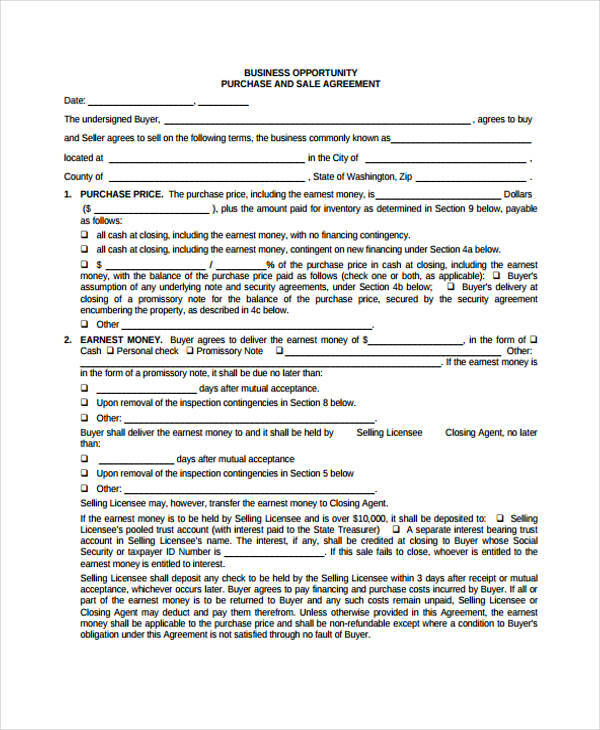 Purchase Agreement Forms can be used in different purchases and acquisitions but is mostly useful for real estate selling. Business ownership transfer should be well documented. 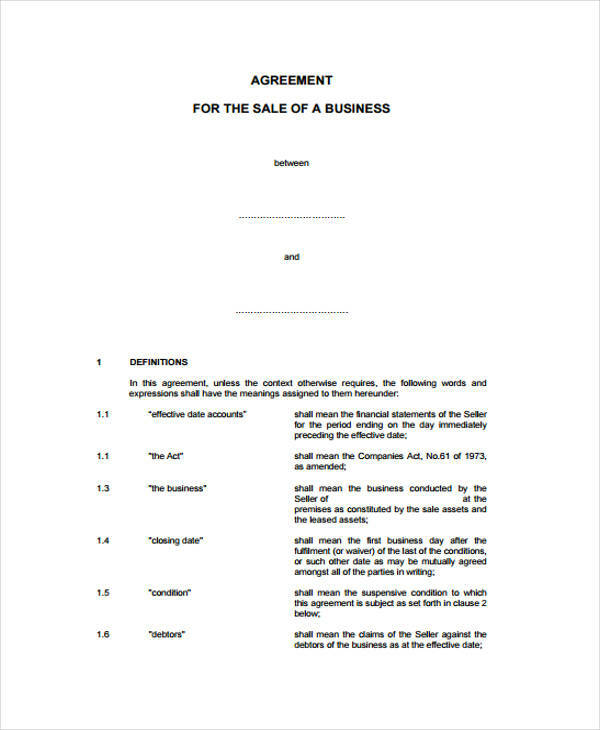 This is the reason why it is important for a business owner to use a sales and purchase agreement for business form to record all the information relevant to be known by the entity to whom the ownership of the business will be transferred to. This kind of Business Agreement is focused mainly on the financial aspects that should be considered by the parties within the duration of the agreement. 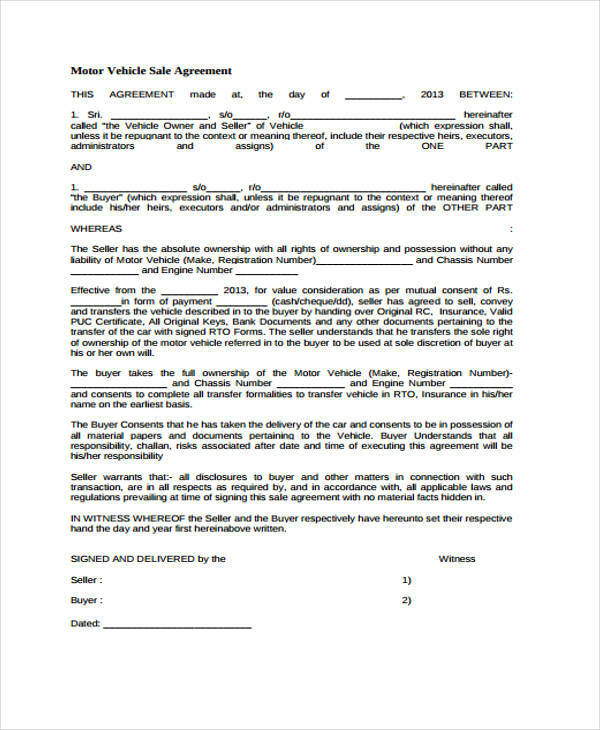 A Vehicle Sale Agreement Form is an important document that should always be present whenever there will be a vehicle sales that will take place. 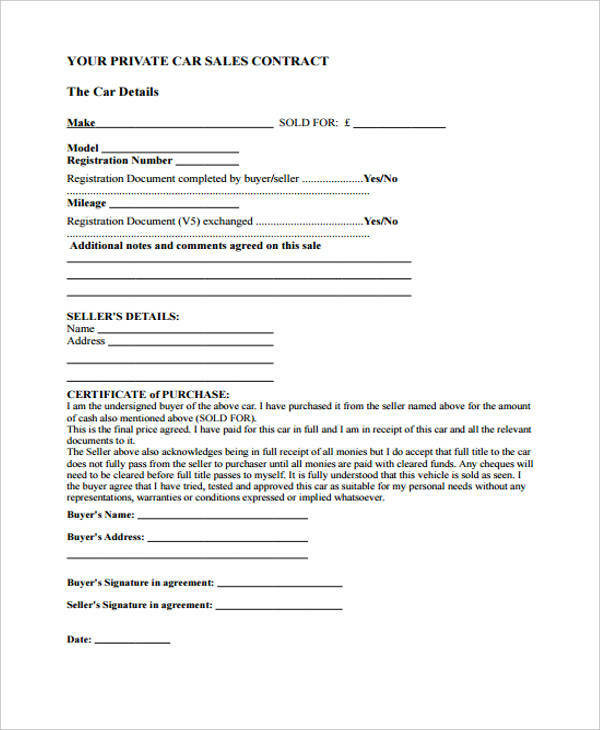 The act of buying or selling a vehicle requires a lot of responsibility both to the seller and the buyer which is why it is highly recommended for a vehicle sale agreement form to be direct to the point and professionally created. 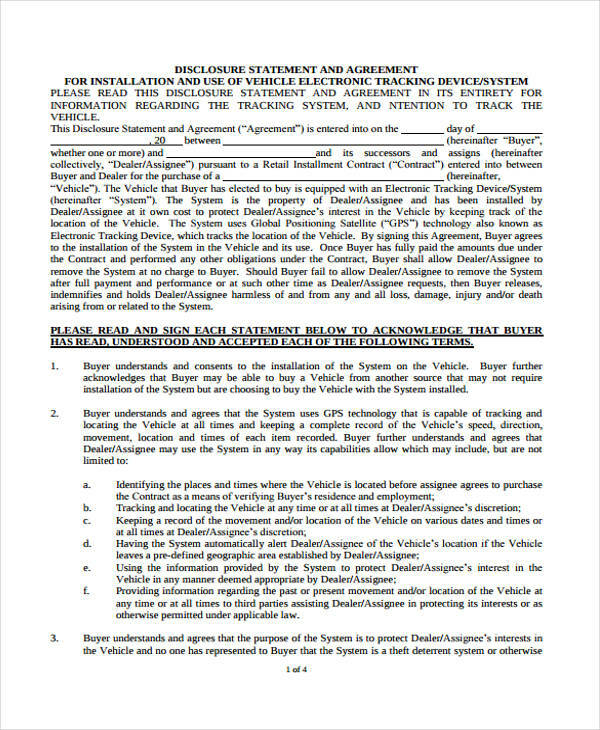 The procedures, terms and conditions that should be followed for the vehicle purchase should be fully stated in the said document. All the parties within the agreement should have a copy of the deal so they will be aware of the legalities of the contract used for the deal. 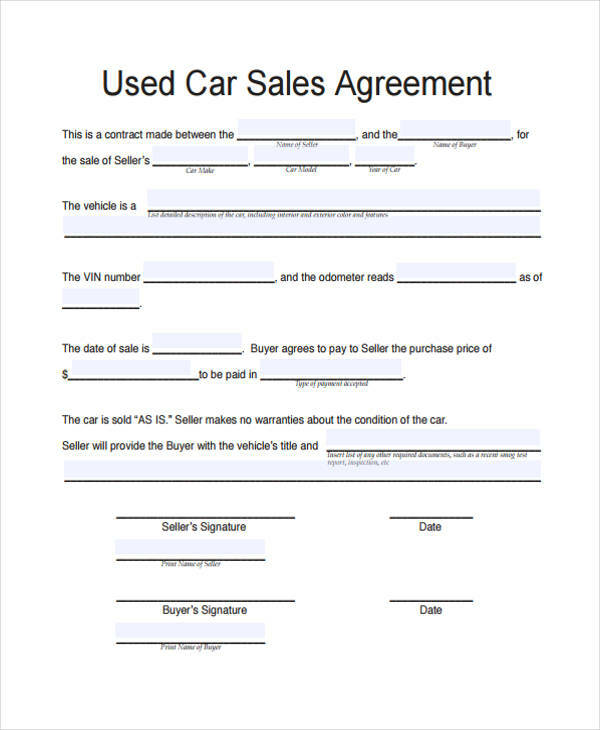 Some of the essential things that should be presented in a car sale contract include the personal details of the buyer, the information about the seller and the business, the kind of vehicle that is purchased by the customer, and the payment terms that must be honored by the buyer and the seller. 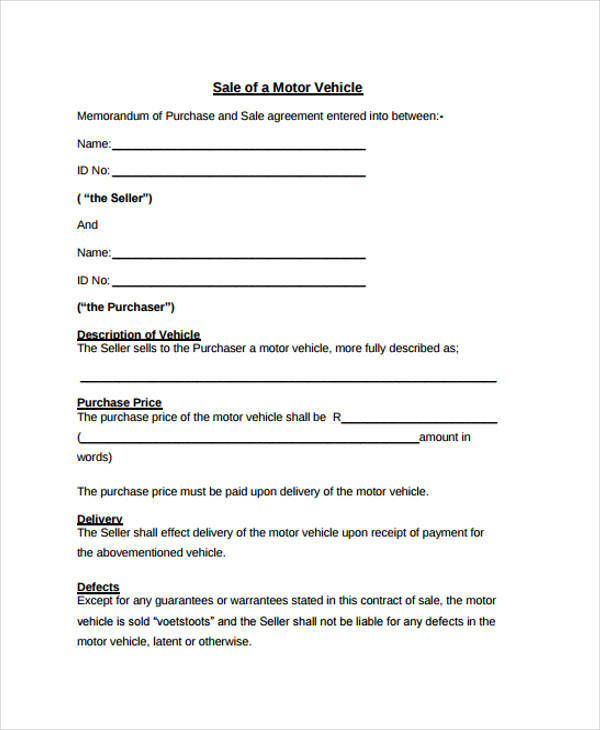 The usage of vehicle sales agreement takes place when an individual who would like to sell his /her vehicle needs a legal document that can protect him/her and the buyer as well. 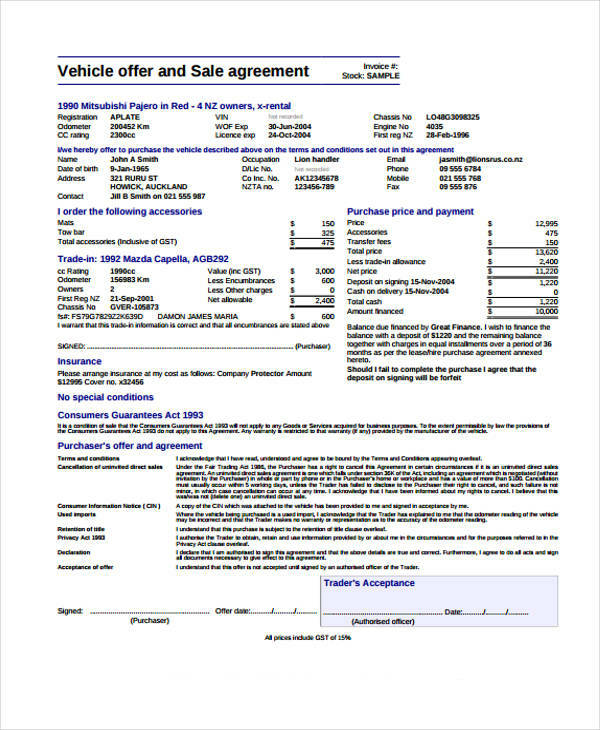 Hence, a vehicle sales agreement should have the complete details of the terms and conditions that the seller and the buyer should adhere to. For the document to be completed and fully usable, the parties should review all the information presented and affix their signatures if there’s nothing that they would like to change or ask about. There are various ways that a vehicle sales agreement may be made and it will all depend on the specifics of the transaction. Buying a home requires a lot of thinking and considerations as the buyer needs to make sure that the property is worth the price that they are willing to pay. Home purchase agreements are important in this case as it provides a well-curated list of the items that the buyer should be aware when considering a home purchase. More so, it also helps the seller to properly present the sale terms and conditions. 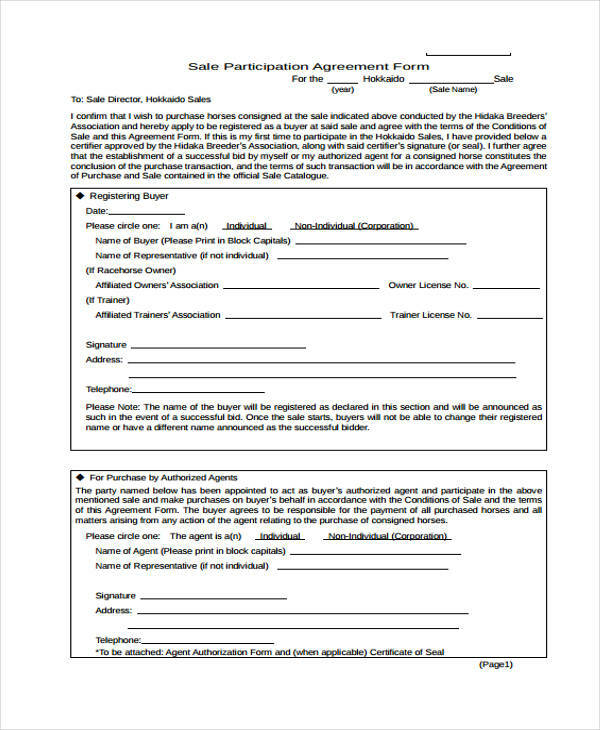 Also called as real estate contract, a home purchase agreement can be made and used in different manners so long as it is complete, relevant and effective. There are some home purchase agreements that are already in full contract terms while there are also some that are still open for negotiation so to close the sale of the property. Regarding the entire housing sale transaction, all the details must be presented in a manner that they are understandable and beneficial to all the parties involved. If you have already decided to buy a home, it will be more of your advantage if you will seek the help of a real estate counselor or an attorney who can help you keenly observe and learn the details present in the home purchase agreement. Always remember that buying a house is a responsibility that you need to keep for a long term. From the purchase of the property where you will be required to process papers for financial assessments, contract agreements, and payment terms; it truly is a lot of work that you need to be specific on to ensure that all the procedures needed for the transaction will smoothly flow. In terms of land purchase for residential purposes, you need to be more particular. Identify whether the location of the property is suitable for your lifestyle and the daily transactions that you need to fulfill. Though this can be deemed as a challenge, being able to address this issue right away will allow you to specify your needs as a buyer. This will help a real estate agent to know whether the property that you want is fit for all your needs and requirements. Also, make sure that you will set the amount that you are willing to spend to buy a land. Your purchasing power can affect your decisions which is why it is important for you to start addressing your issues when it comes to your financial allocation for the transaction. 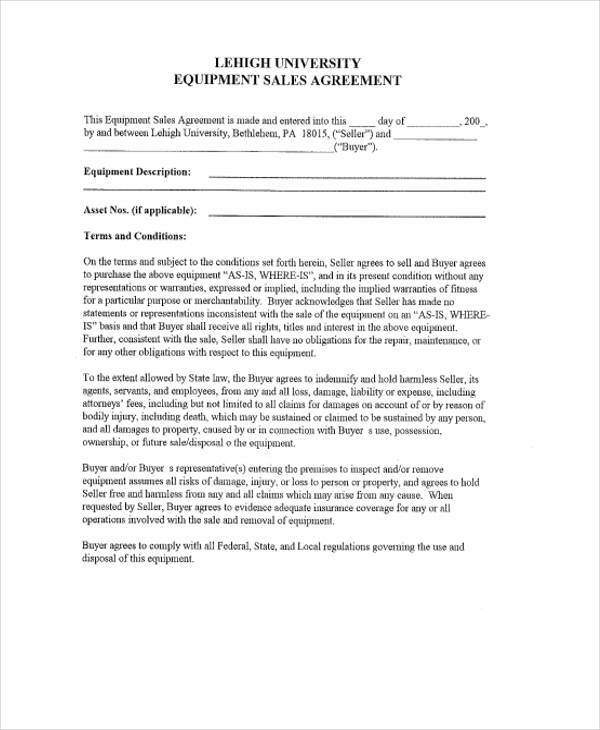 Once these are already settled, you can already easily know the items that you would like to see in a purchase agreement. Ensure that the words that you will use are easily understandable. Your goal when making a purchase agreement offer is to present the contract the best way possible without over promising. When creating the terms of the contract, make sure that there will be a balance with regards to the responsibilities of the the vendor and the property purchaser. Clarifications should be done about the requirements and specific conditions in the contract. It is not enough to have a general overview of the agreement as the signatures of the parties involved only means that they are fully aware of even the smallest detail of the transaction. Having an agreement that is already up for full implementation requires statements concerning the time of effective duration. There should be an area within the agreement form that states the time period in which the arrangement will be considered valid. However, be reminded that these arrangements are not restricted by the initial time periods as there can be changes that the seller and buyer can apply varying on any new discussions that they will agree on. These time frames and time periods play an important role in assuring that the seller and the buyer are at the same page when it comes to their expectations with one another especially when it comes to payments and the duration by which the offer shall be accepted. Being able to create a time-bound transaction will also allow requirements to be met accordingly. Once an offer to buy has already been approved, the transaction will already push through and the sale can already be made. Again, the seller and the buyer must be aware of all the transaction information for the entire exchange to be smoothly implemented. If you want to create a Home Purchase Agreement, do not be overwhelmed with the information that you need to prepare and be aware of. It may be complex at first, but it will depend on your organization skills on how you can present information accordingly. Remember that understanding the details of a home purchase agreement can help you create a more structured content layout. More so, it can provide both the seller and the buyer a contract that is suitable for their needs, plotted in a clear and presentable manner. 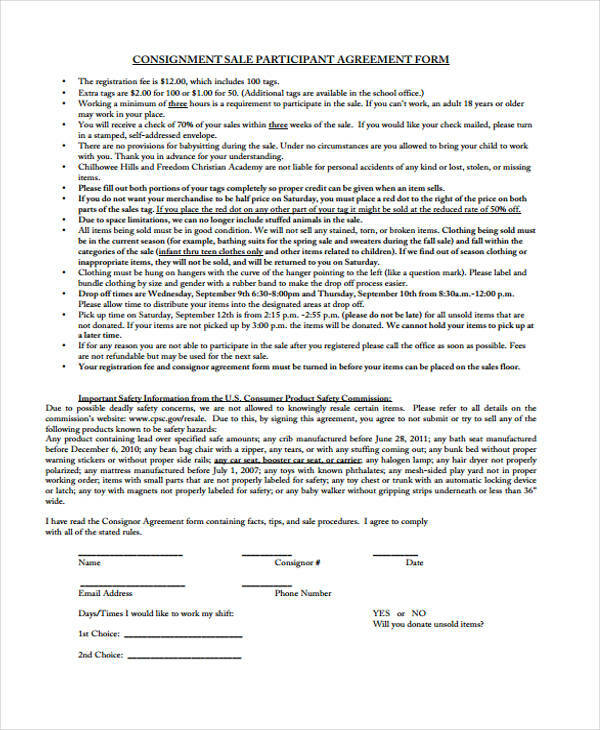 Make sure to include the details listed below when making a home purchase agreement. If we will go the technical route, there are actually only two parties involved in an agreement – the buyer and the seller. However, with the need for legal support and other information, the presence of an agent and an attorney may be needed at some circumstances. Also, there can be multiple shareholders that can be involved in the selling of a property. When making an agreement for the sale of a Real Estate Property, make sure to be keen with the details of the entities present within the transaction. Always make it a point to review all the dates that you will put in the agreement as it can affect the entire transaction. 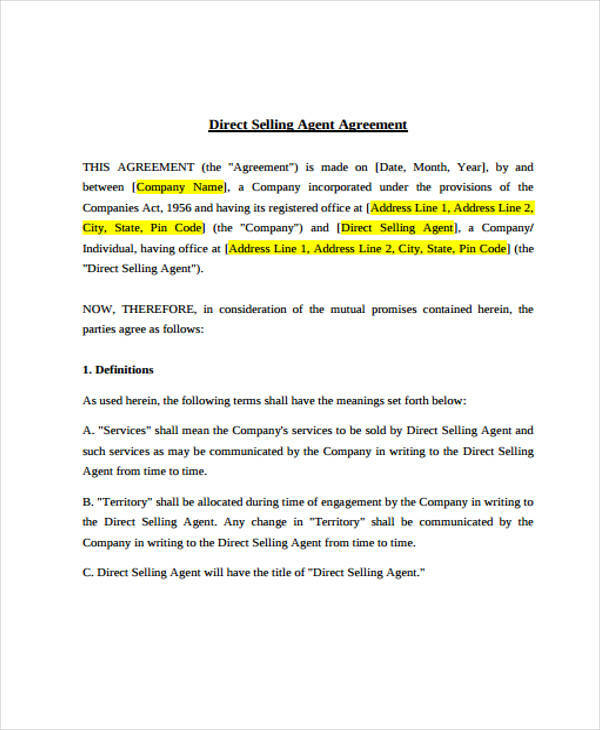 Be accurate when writing the agreement’s starting and expiration date as well as the given date in which the title should already be handled by the buyer. It will also be best to create a schedule for the payment dates so to set the expectations of the seller from the buyer. 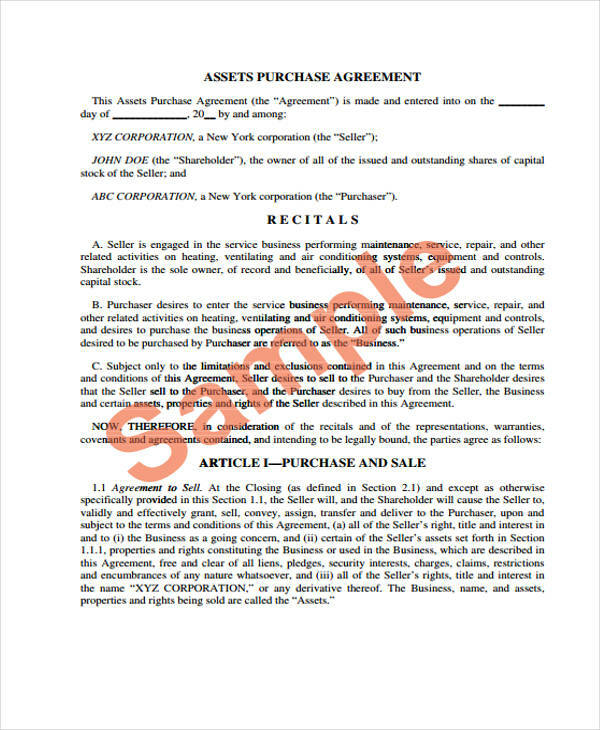 One of the most important details that you need to put in the document that you will create is the agreement to sell and purchase. This part includes the statement about the exchanges that will occur with the parties. This also includes the expression regarding the shares of the sale to be free from encumbrances and is not promised to either a moneylender or a bank. There are other details that can be included in this area of the agreement depending on the transaction processes that the seller and/or the buyer has approved and agreed to. The legal description of the property is most likely beneficial to the buyer as it assures him/her that the details of the property are real when comparison to the written information and its actual features. A legal description of the property is commonly given by a surveyor who is licensed to do the job. Sellers and buyers should be sure that the surveyor that will be hired to do the job is properly trained and authorized. This will give them more comfort that the property’s legal description is determined accordingly. When making a home purchase agreement, be informed of the closing costs. This cost is the total amount of the expenses that are above the property’s actual price. A closing cost includes the insurance of the title, the fees used for loan application, the escrow fees and the like. This closing cost can be specified accordingly so a buyer can have an option for “seller assist” which is the condition in which the seller is expected to cover the specified amount, or a portion of it – depending on the buyer and the seller’s agreement. There should also be conditions in which the buyer can cancel the home purchase agreement. 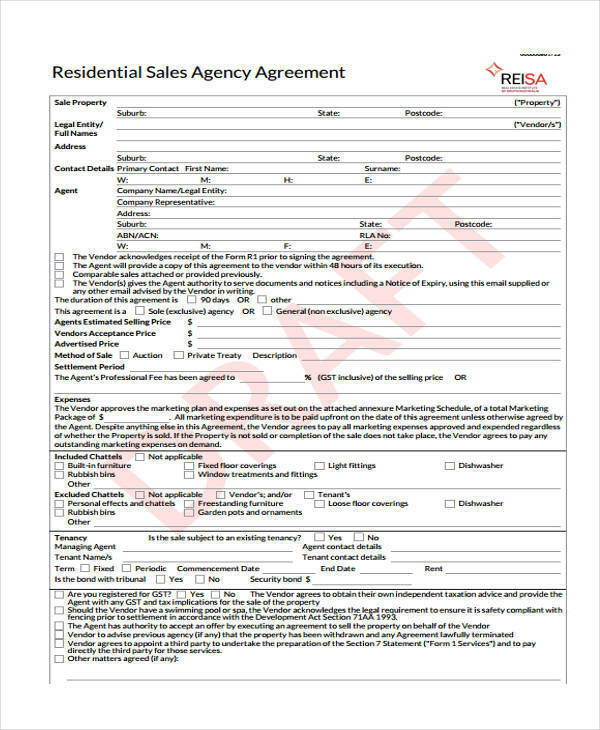 This can be done if it has been specified in the home purchase agreement form that the results of the home inspection contingency can allow the specified decision, once findings are proven to be legal, real, and valid. Never forget to attach the signatures of the parties involved in the transaction. 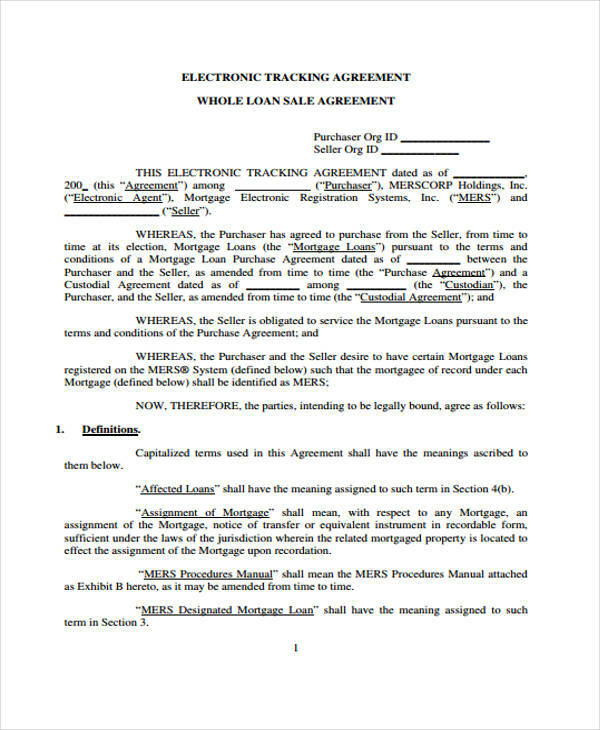 As the last portion of a Home Purchase Agreement, the signatures of all the parties signifies that all the details present in the document are already approved by both ends of the agreement. Transactions related to the selling and buying of properties should always be complete and well-recorded as disputes may occur if there are glitches and loop holes in the processes applied within the entire process. 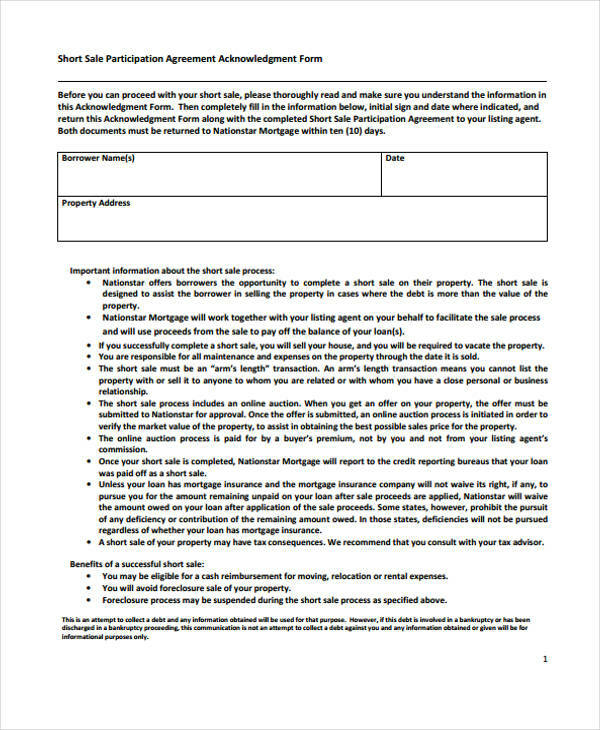 With all the information mentioned above present in a home purchase agreement, it is most likely that misunderstandings may occur within the entirety of the purchase period. 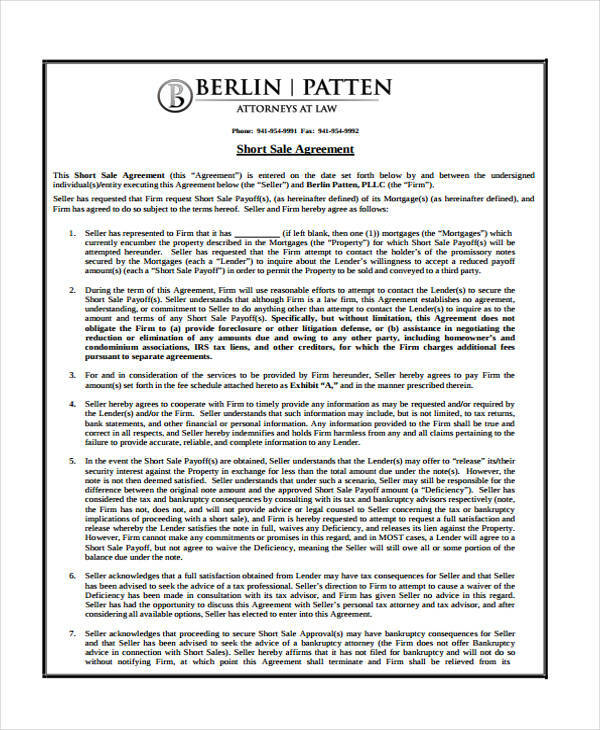 With the discussion presented above, it is evident that a sales agreement form is truly of value in various transactions of sale. 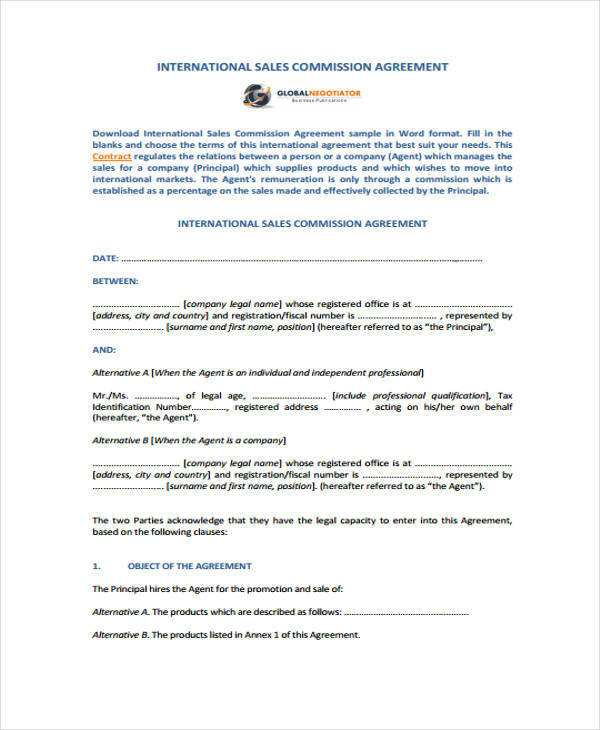 Both the buyers and sellers can benefit from the usage of this document as it relays all the legalities of the agreement and how these shall be applied within the process of exchange. For a seller, it is important to assure that the price that the buyer is willing to provide is worthy of the item or property to be sold. On the other hand, buyers should also be protected when it comes to the quality of the product that he / she will buy. 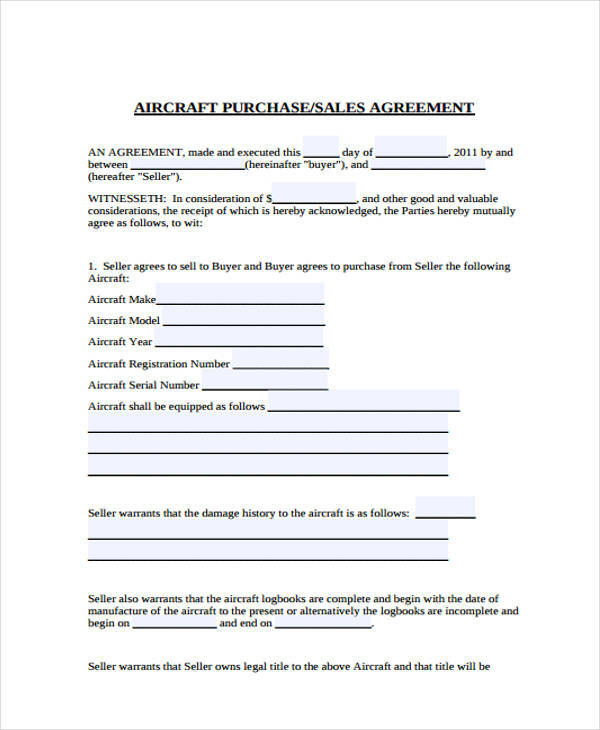 Using an Agreement Form will be very helpful when putting the details of a sales agreement all together. 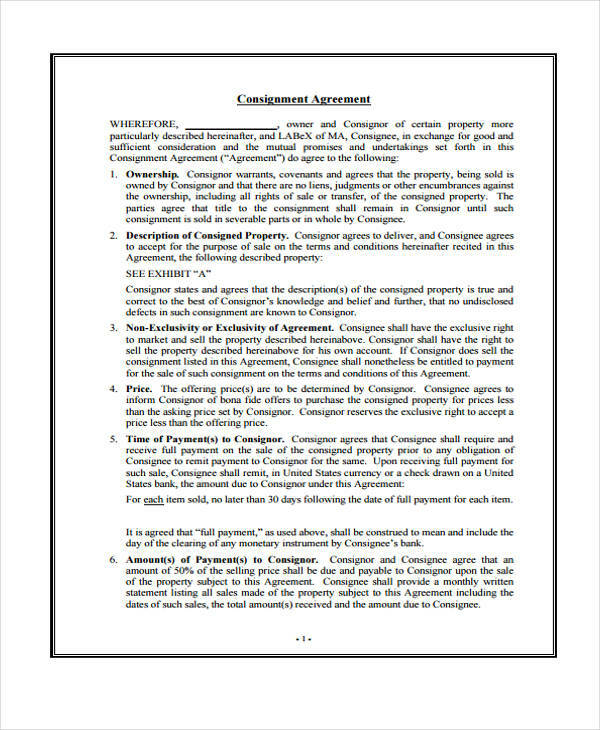 Since initial sales agreement is a factor that is needed to be taken into consideration in every sale transaction, a form stating all the content of the Sales Agreement is a strong evidence that the seller and the buyer has already initially agreed with the specifics of a particular transaction. 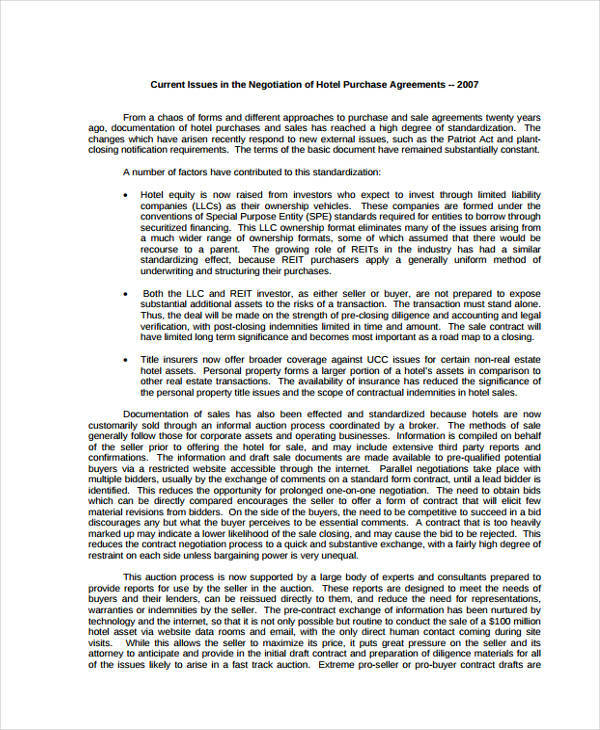 Being able to prove that there is already a complete agreement can help arrange and answer disputes that may possibly happen in the future if changes are needed by only just one party and is not approved by the other. The real reason why people no longer make verbal sales agreements is that nothing spoken is ever taken to be legal. They are subject to forgetfulness and depreciation. 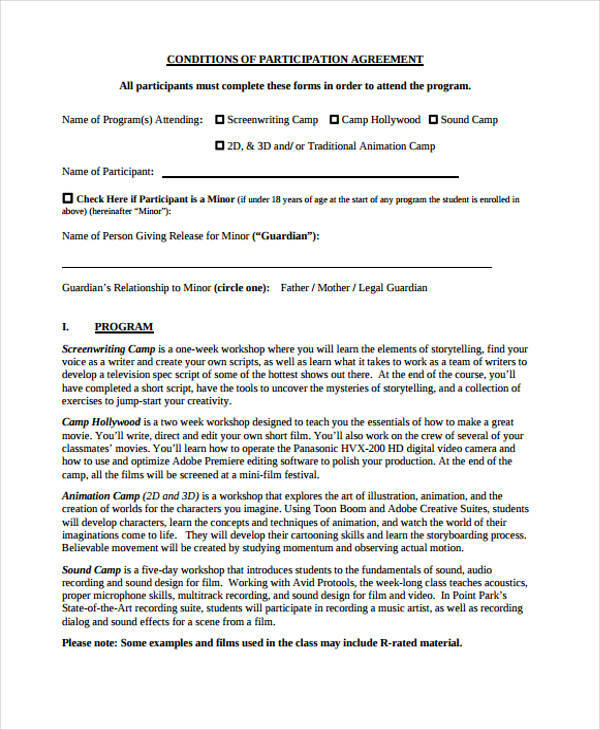 Written agreements, on the other hand, are legally binding. And what makes them tremendous is that you can always use them as a reference whenever the need to do so arises. There are purchase and sales agreements that are designed by experts. However, this may not always be the case. If you are not secured with the effectiveness of the purchase and sales agreement that you will use, you can easily seek the help of lawyers and attorneys. This will allow you to understand the content of the transaction even more. 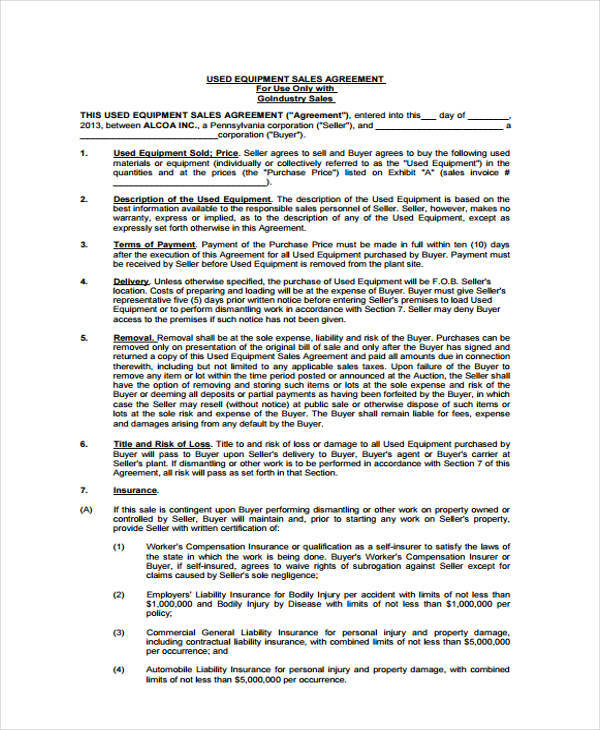 Purchase and sales agreements are specifically made for every transaction. This way, all parties involved can assure that the content of these documents are customized based on their needs. Since purchase and sales agreements are legally binding, they can be formatted accordingly and be used based on the rules that apply on the location where the purchase and sales agreement will be used and where its effectiveness will be practiced. Judicial courts accept these documents to be used as valid proofs for cases that are needed to be solved in relation to a purchase. 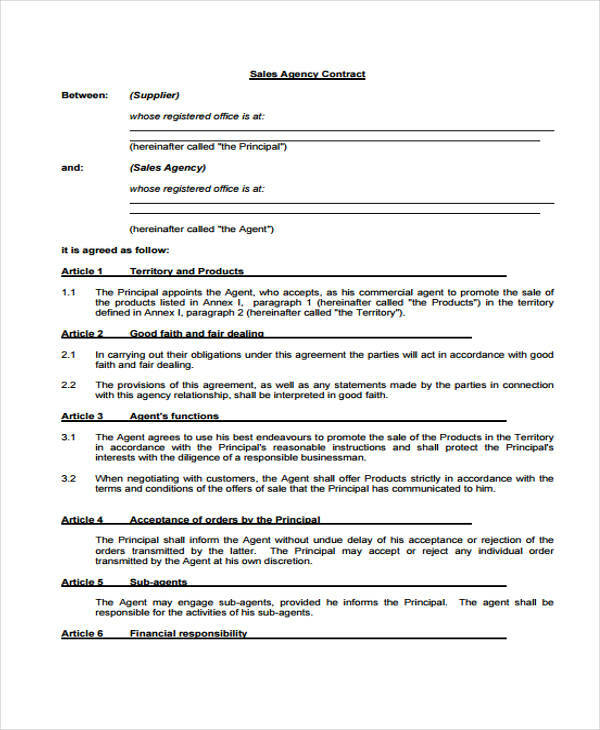 Having an actual list of agreements allows all the parties to not forget any important information related to the transaction. 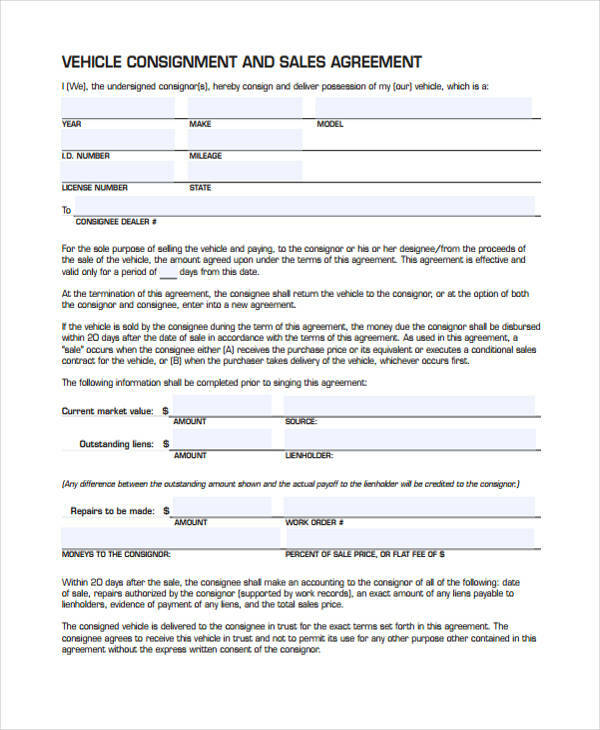 If you are not confident to create a purchase and sales agreement or you are afraid to start drafting the document, it will be best for you to check templates that can serve as your references in making one. 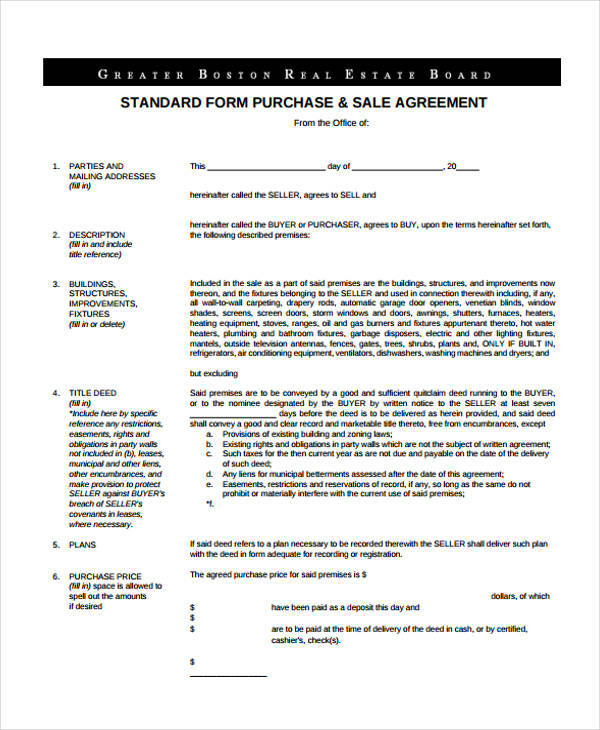 Since there are different kinds of transactions where this document can be used just like how Buy-Sell Agreement Forms work, make sure to look for templates that can address your specific needs. You can always add or deduct information based on the things that you need to present to the other party involved in the processing of the purchase.